I’m in the midst freshening up some of my favorite spaces at home. I still love the direction everything is headed with warm neutrals and varying shades of white. I was walking around one day taking notes of the little changes I wanted to make when I saw my favorite screen door propped on one of the walls in the living room. 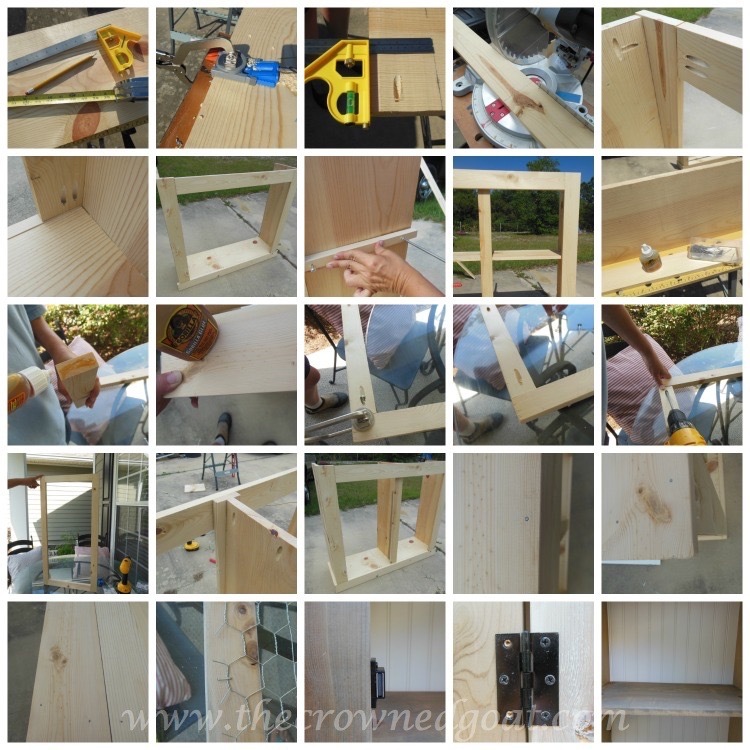 I thought I would be able to make a cabinet out of it and use it in the entry. But once I started taking measurements I realized it was going to be way too big. I searched online for inspiration and found these plans. 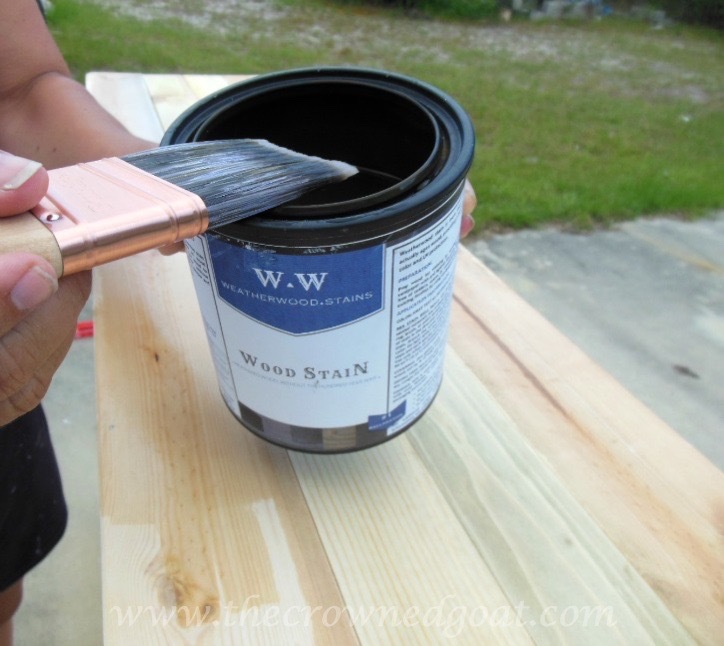 Around the same time, I got the opportunity (thank you Sydney and Weatherwood Stains) to participate in a product review for a stain that gave raw wood the appearance of reclaimed wood. I called my bestie, S to help me build the cabinet and she agreed to give it a go. 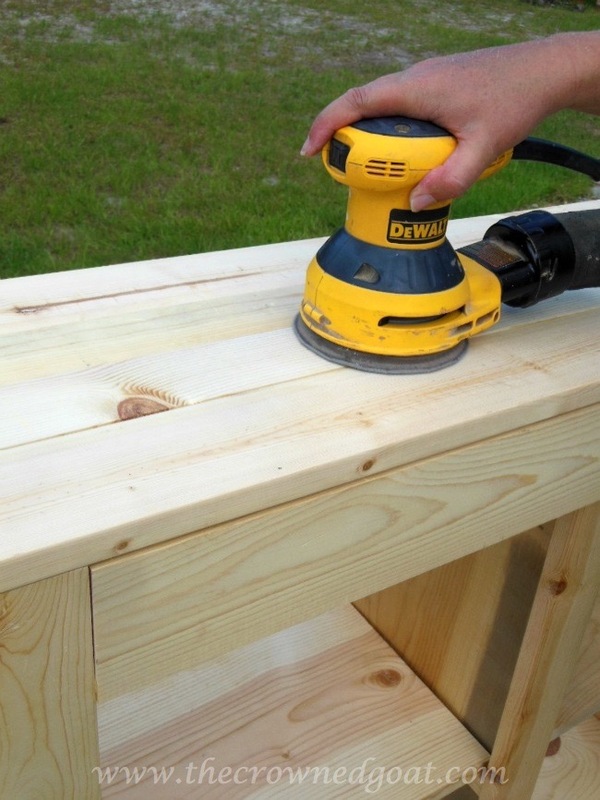 Once we had the base of the cabinet completed, we sanded the entire piece down using 80-grit sandpaper and an orbital sander. The wood we chose is raw pine. It’s free of conditioners and has not been pretreated. What makes this stain product unique is the weathered color will change depending on what kind of wood you choose to use. Using a staining brush, I started applying the stain to the planked top first. The stain has an odor but I didn’t find it overwhelming. 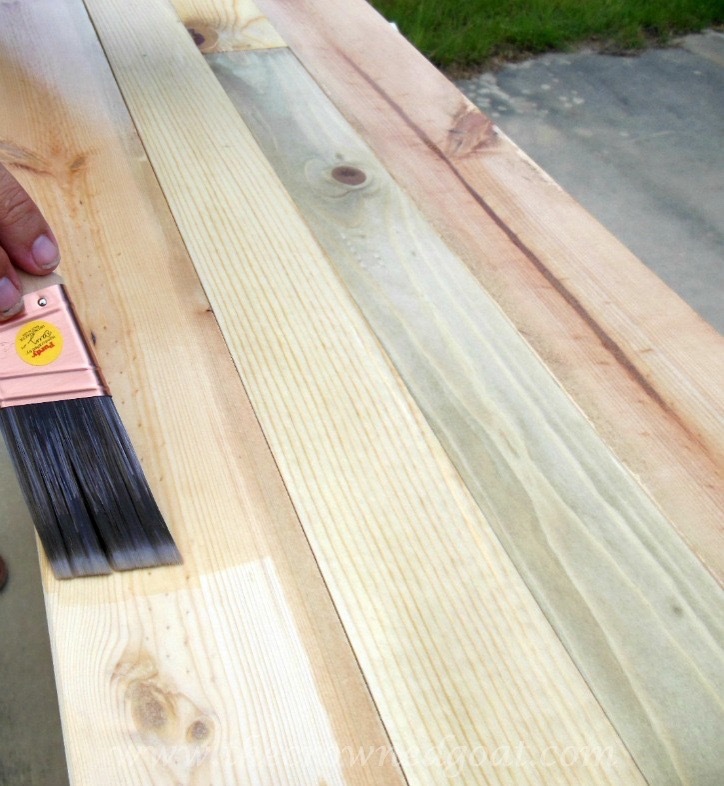 The water based stain is almost transparent so you really have to pay attention to which portion of the wood that’s been saturated. 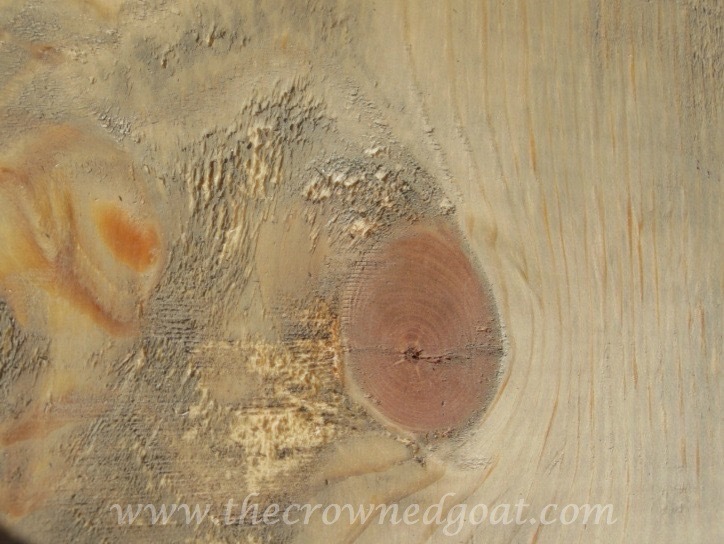 Within minutes, this is how the stain looked on the planked top. 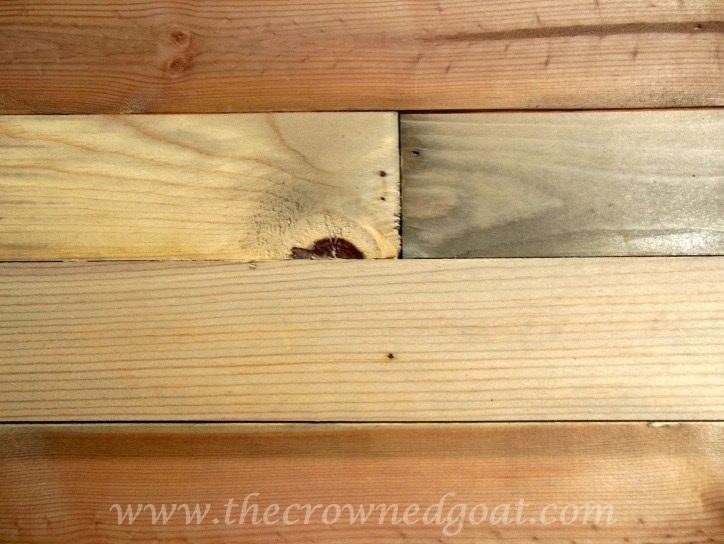 Four different shades all raw pine. This is one of the cool wood knots we saved for the bottom portion of the cabinet. The stain does give the wood a weathered appearance as promised. But it was my experience you really have to saturate the wood and even then you may not get a consistent finish. I applied multiple coats of stain throughout the day. I decided to let the stain cure overnight and woke to this shade of stain the next morning. It still wasn’t as dark and weathered as I had envisioned. I applied the stain one last time and let it dry in the sun while we built the cabinet doors, affixed the hardware, trim and added bead board to the back of the cabinet. The 4 different shades of stain on the planked top never changed color even after multiple applications. 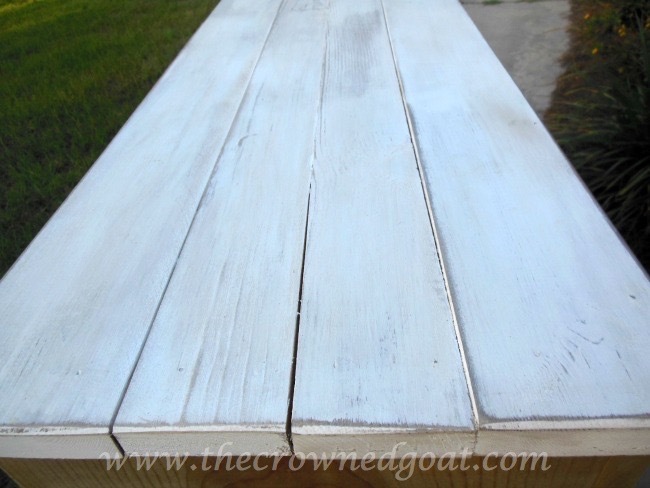 For this reason alone, I decided to paint the planked top with Annie Sloan Chalk Paint in Pure White. After a little distressing, look how beautiful it turned out. Once I painted the top white, I decided to balance it out by adding white wax to the door trim. The rest of the cabinet was sealed with soft furniture wax. I’m so happy with the results now. This cabinet is so utilitarian there are a few places it could go in the house. Right now I’m trying it out by the kitchen table. But there’s a chance it could wind up in the entry or even my office. Disclosure: I was given a can of Reclamation Stain by Weatherwood Stains, LLC in exchange for an honest review. All experiences, ideas, opinions and photographs are my own. My disclosure policy can be found here. See you guys back here tomorrow for Thrift Score Thursday! I had been wondering about this product. Thanks for reviewing it. I love how your cabinet turned out. That was an ambitious building project, but it is holding your ironstone beautifully. Thank you bunches, Nancy, I really appreciate it! Wow! 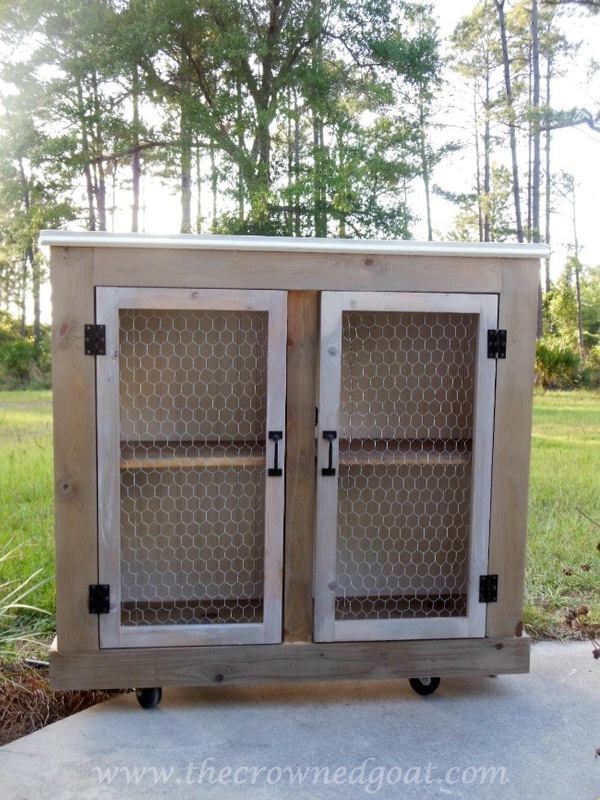 It’s gorgeous and chicken wire has never been so cleverly used ! I really appreciate it Maya, thank you! That is so gorgeous! You have mad construction skills, woman! I could never build something like that. 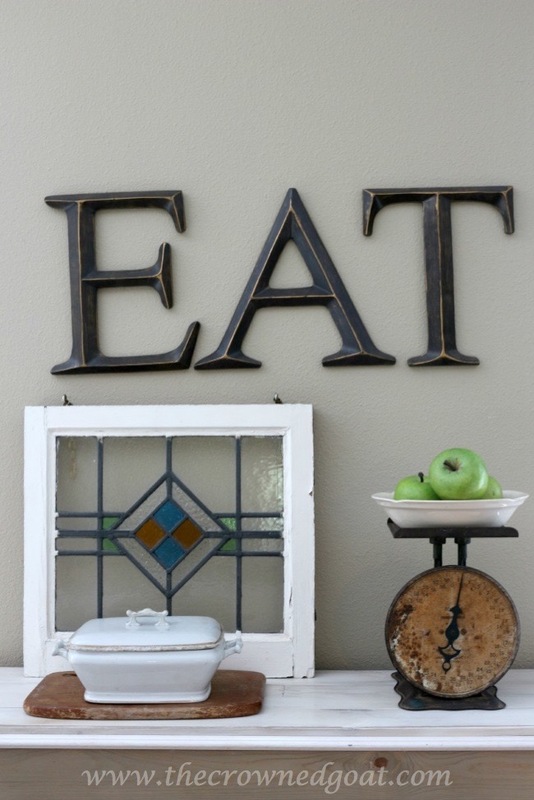 I really love the white paint mixed with the weathered gray. It really turned out gorgeous, you did a fantastic job!! So impressive. 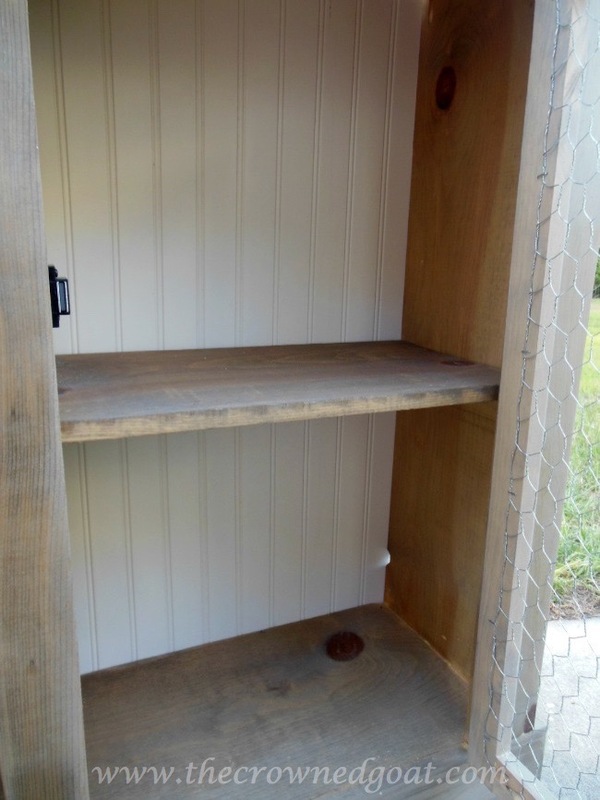 I could never build a cabinet like this….I am doing good to just repair furniture….Your Ironstone looks pretty displayed in your new cabinet. Love the white accents you added to the cabinet, nice finishing touch. Have a great Wednesday. I love your cabinet. I’m so glad to see this review. 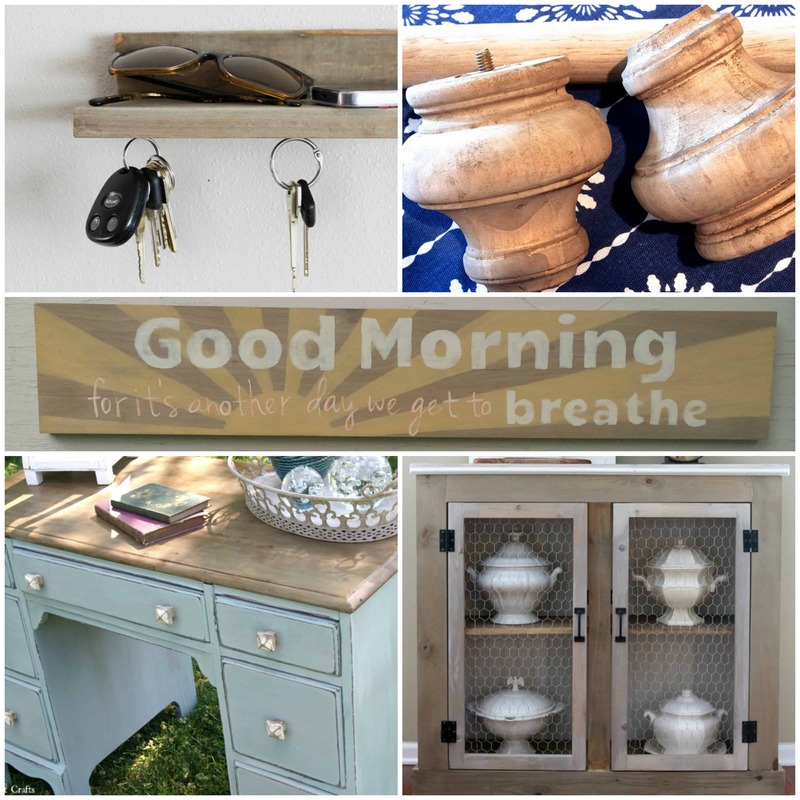 I love the weathered wood look and to know there are some products out there…even thought it’s not perfect. You’re cabinet looks perfect in the end! Your building and painting skills are amazing 🙂 Going to check out the other projects! That cabinet turned out amazing!! The stain color is very pretty! The cabinet looks like the perfect size for pretty much any room in the house!! I love those dishes you have in your kitchen!! Love the finish on the new wood…..I always hate how stained wood looks when doing it on something unfinished like this. I wish I would have agreed to try this product out now!!! Your cabinet is beautiful! CoCo this cabinet is gorgeous!! You are so talented!! I love the different shades of white and how they all blend so well together. Wow, Coco, you built a cabinet! I’m so impressed!! 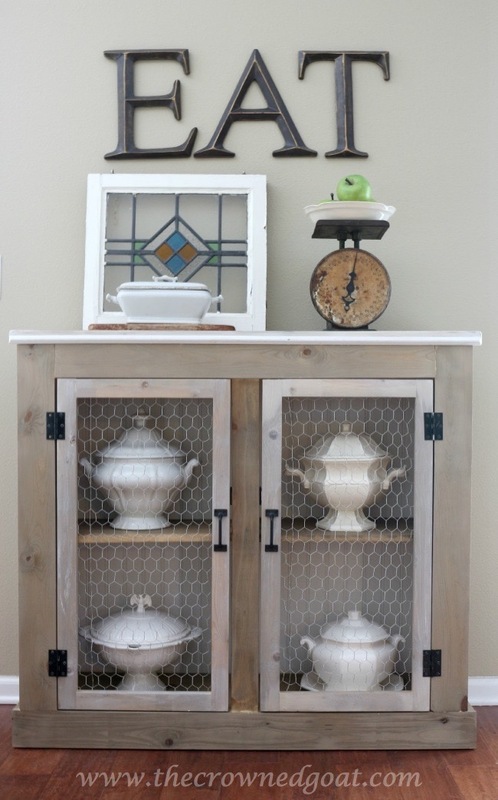 I love the combo of the distressed white and the “aged” wood look. Beautifully done! Coco! I’m not worthy, I’m not worthy! Girl you have got some serious talents. I am so impressed! 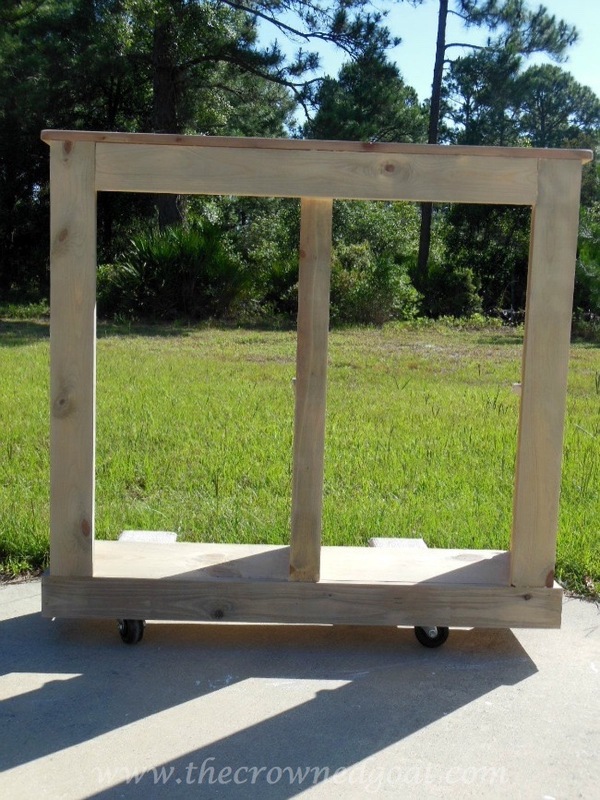 I know pine can be difficult to work with, that’s because it has the least tannin of any wood and the stain reacts to wood tannins. Thanks for staying with it, because your end project looks dynamite! LOVE! Sharing at the link party this evening!